A friend of mine had her birthday recently - a dinner on the Saturday night, with her birthday proper on Monday - and she had herself a little pile... OK, a rather large pile of birthday presents that took up a substantial amount of room on the dinner table at the restaurant. When I rung her up on Monday to wish her happy birthday (I didn't spend long at the dinner since I had to be somewhere else so didn't get much time to talk to the birthday girl), she said she had quite a lot more stuff on top of all that which I managed to glimpse at her dinner and said that this is probably the year she's ever received the most presents from friends and family. I laughed and said that my pile of presents has been dwindling as the years go by. My comment came from the obvious thought that kids ask for a lot of stuff; I was no different when I was young, wanting pretty much every Transformer and large Lego set under the sun. But when the call ended, I gave some thought to what I've actually received this year under the 'birthday' umbrella. The earliest birthday present I received this year was in early July! You see my friend, the Hug Nazi, has this sort of tradition that when my birthday comes around, she will happen to have some plans that will take her out of the country and miss my actual birthday. This has been happening every year without fail since I turned 21. This year was no exception. To absolve herself of the guilt of missing my birthday yet again, she took me to the zoo for the red panda encounter - knowing full well that red pandas are my favourite animal (it was on a zoo trip back when we were 20 or some young age when I spotted them and they instantly became my picture definition of the word 'cute'). Then nothing until my birthday on which I replied to all the birthday messages I received over Facebook / Twitter / text message. 'Birthday week', as I called it on Twitter, continued as I received a short letter, Lego man, and penguin-shaped tape dispenser from the hug nazi via snail mail from Japan (does she really feel that guilty? ), and she also got her boyfriend (still in NZ and not living far from me) to deliver to me an old magazine with an article for making pasta - Italian cooking is something I'm also quite into. When I got back to work, one of my workmates gave me a cream bun that she baked herself, and when I had the weekly lunch with some of the friends I've made through work, the guys paid for my lunch. That weekend, I had my family take me out to dinner at my favourite Italian restaurant/trattoria - another birthday tradition I've kept since turning 21. Then nothing again for a while and I thought it was all over, until this weekend where I received a gift card that made me go "Whoa" like Keanu Reeves does in pretty much every movie he's ever been in (they do say that gift cards are kind of a cop-out when it comes to gift giving, but if you can get the right one it's totally just as good as getting a present), and another present some 6+ years in the making. 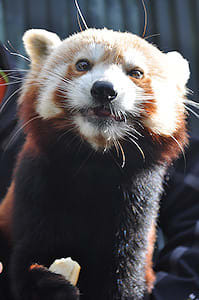 The latter came from another friend who also knows of my affinity for red pandas. Soon after that visit to the zoo back when I was 20, a short New Zealand TV series about zoo animals aired and had some soft toy merchandise to go with it. I went and bought the red panda soft toy from my friend's work when she let me know that they had stock and she held one for me until I could come by. 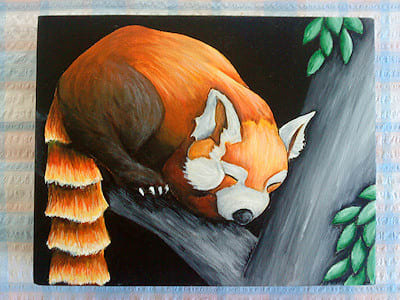 That gave her an idea for a birthday present for my 21st which was to make a red panda painting. I never had a 21st birthday party though, so the half-finished painting was left on the back-burner for several years. She moved house recently, and while packing found the old picture and resolved to complete it this year. She did, and her card stated that it was several things: a very belated 21st present, a 'sorry my grandad died' present (more on that in a future blog post), and a 'thank you for helping with the computer science papers at uni' present. Some things make me feel really blessed. This is definitely one of them. When I look back throughout the year and think of all the things I got for my birthday, I don't know where the heck I get away with saying that I've been getting less and less stuff. Sure, as I age I find myself asking for less and less; especially now that I have the means to take care of myself and get most of whatever I want: clothes, food, the occasional video game, etc. But to make up for it, I've found that those around me like to give more and more of what I need - sincere birthday wishes, good times, and tokens representative of the what I mean to others. It's a pretty good trade-off if you ask me.